THE LATEST ENGLISH PREMIER LEAGUE NEWS – Chelsea interim manager Rafael Benitez can expect more jeers from the home crowd as fans firmly stated that they would continue to show antagonism to the Spaniard. Rafa, the man who led Liverpool to win w1th ease in matches during his 2004-2010 reign at the club, has figured in previous bitter situations against Chelsea, including an incident in which he accused ex-Blues striker Didier Drogba of diving. The impending departures of Frank Lampard and Ashley Cole – both being fan favourites, have reportedly increased the tension. 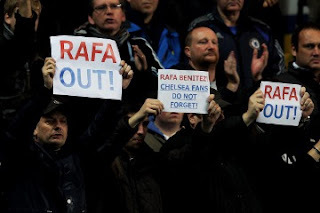 Trizia Fiorellino, chairperson of the Chelsea Supporters’ Group, stated on behalf of the fans that they did not want Rafa to become Roberto di Matteo’s replacement, nor have the Italian replaced in the first place.